Spherical design blends easier to most surroundings. Comes with a 1.7mm lens to give you a 150° Wide Angle view. Mounting bracket has two swivel points for 160° Pan/Tilt. 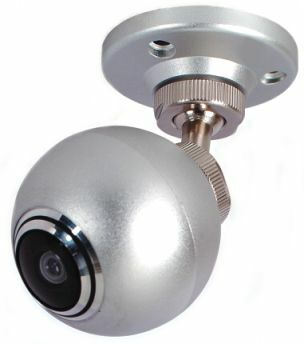 Camera lead wires extend through the mounting bracket for a clean flush mounting without wires showing or use the notch in the base to run wires externally along walls if needed. Sphere Diameter 2" (L) with bracket is 4"
At 15 feet from target your horizontal view is 42.4 feet and your vertical view is 31.8 feet.